Although Marvel movies have generally fared well critically and commercially at the box-office, they’ve often received two major criticisms: a lackluster villain and a formulaic structure. And somehow it looks like both the upcoming Avengers movies are going to tackle this issue head-on. Whereas Avengers: Infinity War is presenting Thanos as one of the more complex and layered villains to grace the Marvel Cinematic Universe, its sequel Avengers 4 looks hell-bent on shaking the predictable nature of superhero movies in general. At least if the recent set photos are anything to go by. 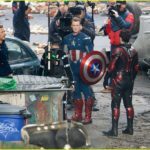 Just Jared as always, got their hands on a handful of images straight out of the Avengers 4 set. 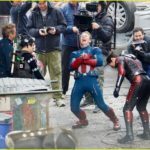 The images show Chris Evans, Robert Downey Jr., Mark Ruffalo filming what resemble scenes from the Battle of New York in 2012’s The Avengers, as evident by Evans’ old Captain America uniform. 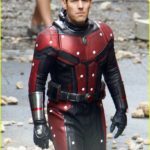 What’s really strange is seeing Ant-Man in the mix with them. 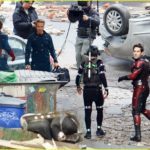 That’s right, whether or not Scott Lang is or was in the Battle of New York; he’s definitely on location shooting with them. 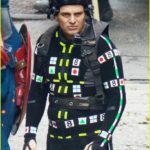 The last time such pictures of Avengers 4 came out in their 2012 costumes, fans immediately jumped the gun and postulated that Avengers 4 is going to feature some heavy duty time travel. 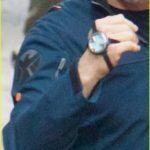 Those rumors were squashed for a while when a Reddit user who claimed to be on the set as an extra revealed that the scenes were part of a B.A.R.F. sequence. For those not in the loop, B.A.R.F. or Binary Augmented Retro-Framing is the technology Tony Stark introduced in his opening MIT keynote in Civil War which allows a holographic and yet photo-realistic reconstruction of past events. It was assumed then than the Avengers revisit events from the past through that tech looking for clues to successfully defeat Thanos. These recent photos though kinda cast shadow over that theory. 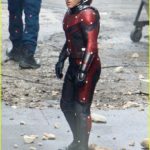 Perhaps the biggest mystery surrounding the pics is Ant-Man’s inclusion among The Avengers which is bound to be the fodder for numerous fan theories going forth. Some can be concocted by looking at the pics more closely. The possibility of time travel of some sort does look increasingly likely. It could be possible The Avengers travel or are sent back in time with no recollection of their memories and a hapless Scott Lang, navigating the boundless expanse of the Quantum Realm is the only one aware of what’s happening. He’ll be frantically trying to ignite the memories of his comrades, recruit them and bring them back to present day. Or this could very well be a case of the Multiverse setup in place where the Avengers, at the end of Infinity War, find themselves in an alternate reality where things play out differently. Noticeably, all the actors seem to have some kind of wrist bands on their hand. Now this could either indicate the presence of a device that’s been used for time-travelling or it could simply be Marvel trying to throw us off deliberately by feeding us false information to speculate upon. 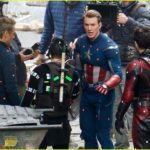 Moreover, Stark doesn’t seem to be wearing his standard uniform although with all the markers on them, it could very well be CGI-ed with Iron Man armor. Speaking of which, the presence of markers all over them again makes it possible that some shimmering effect of some sort could be overlaid upon their bodies which in turn again makes the possibility of this being a B.A.R.F. sequence likely. Finally, and this is a rather crazy theory, Scott Lang and Luis could simply be narrating the events of the Battle of New York giving them a different spin, one where Lang was not only there but turned up saving the day and leading The Avengers to fight the Chitauri. 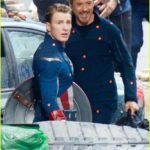 The shots of Captain America laughing real hard, if they’re part of the filming, are the ones that lend some support to this theory; it’s only in Lang’s flashback that we could see Rogers laughing at a situation as serious as an alien invasion. Whatever be the result, these photos have left us bewildered and confused and in a good way. For once, there’s absolutely no way we can figure out how a Marvel movie will play out. You can check out some of the photos in our gallery below. 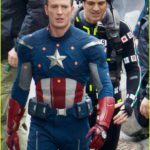 Head on over to Just Jared via the source link below to view the complete batch of 38 photos and don’t forget to like us for more Avengers and Marvel Cinematic Universe news. Avengers 4 will be out in theaters next year on May 4, 2019.